In August of 2012, Google announced an update to its search algorithm that targeted websites receiving a high number of DMCA takedown requests. The update was unofficially called “The Pirate Update”, based on the concept of pirating someone else’s content like music, movies, articles, etc. With the update, Google explained that “sites receiving a lot of removal notices may appear lower in our results.” For most websites, this wasn’t a big deal. But for others, this was more than just a proverbial “shot across the bow”. It was a full-blown cannon shot right through the hull of a ship. I do a lot of algorithm update work, including Panda, Penguin, and Phantom work, so it’s not unusual for website owners to contact me about major drops in traffic that look algorithmic. And I’ve had several companies contact me since August 2012 that believed the Pirate update could be the cause of their drop. Regarding dates, the update first rolled out in August of 2012, and the impact could be seen almost immediately. I’ll cover more about how I know that soon. My goal with this post is to introduce the Pirate update, explain how you can analyze DMCA takedowns requests (via data Google provides), and explore the threshold of removal requests that could get a site algorithmically impacted (or what I’m calling “The Threshold Impact”). So without further ado, it’s time to sail into dangerous waters. So, what’s a DMCA takedown? It’s essentially a notice sent to an online service provider explaining that infringing material resides on its network, and that the infringing url(s) or website should be taken down. As you can imagine Google receives many of these takedown requests on a regular basis, and it provides a simple process for filing takedowns. 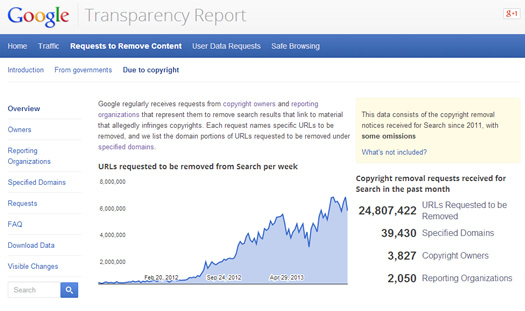 Actually, Google provides a complete transparency report where it lists a slew of data regarding removal requests, copyright owners, domains specified in DMCA notices, etc. I’ll explain more about that data next. For the purposes of this post (focused on the Pirate update), DMCA takedowns are sent to Google when someone or some entity believes urls on your website contain their copyrighted material. And of course, those urls are probably ranking for target queries. So, companies can go through the process of filing a copyright complaint, Google will investigate the issue, and take action if warranted (which means Google will remove the url(s) from the search results). In addition, every request is documented, so Google can start to tally up the number of DMCA notices that target your domain. And that’s extremely important when it comes to the Pirate algorithm. And jumping back to Google’s original post about the Pirate Update, Google says, “Sites with high numbers of removal notices may appear lower in our results.” So every time a new takedown notice comes in, you have one more strike against you. Now, we don’t know how many strikes a site needs to receive before the Pirate algorithm kicks in, and I try and shed some light on that later in this post. I mentioned earlier that Google provides a Transparency Report, where it lists requests to remove content from its services (from governments, and due to copyright). The section of the Transparency Report focused on copyright requests provides a wealth of data regarding takedown notices, domains being specified in those takedowns, top copyright owners, etc. You can see on the site that over 5M urls were requested to be taken down by Google just last week, and 24M in the past month! Yes, it’s a big problem (and a huge undertaking by Google). Being a data nut, I was like a kid in a candy store when I started going through this data. 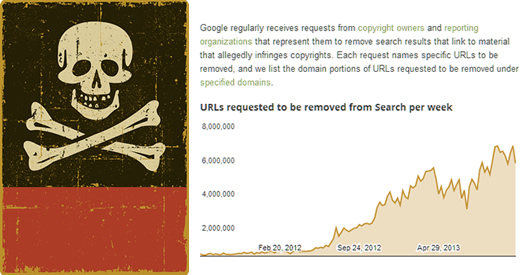 This is the “smoking gun”, so to speak, when analyzing sites that could have been hit by Pirate. By clicking the “Domain Specified” link in the left navigation, you can scroll through a list of the domains being targeted via DMCA takedown notices. You can see the number of copyright owners that have filed notices, the number of reporting organizations (which work on behalf of copyright owners), and the number of urls submitted (that allegedly contain copyrighted material). You can filter this data by week, month, year, or “all available”. And more importantly, you can download the data as a .csv file. This is where it gets interesting. First, and most importantly, the file holding domains contains 14M records. So if you try and simply open the file in Excel, you won’t get very far. Each worksheet in Excel can only contain 1M rows, so you have far too much data to run a simple import. To get around this issue, I imported the file into Access, so I could work with the data in various ways. Note, Access is a database program that enables you to import larger sets of data, and then query that data based on various criteria. It’s a robust desktop database program from Microsoft that comes with certain versions of Microsoft Office. So, you might already have Access installed and not even know it. My goal was to analyze the domains getting hit by the Pirate algorithm, and then also try to identify the threshold Google is using when choosing to target a domain. For example, how many requests needed to be filed, how many urls needed to be targeted, and what’s the “url to total indexed ratio”? More about that last metric soon. Based on heavily reviewing the organic search trending for sites on the list, I wanted to see if there was a threshold for getting algorithmically impacted. For example, did there have to be a certain number of complaints before Google impacted a site algorithmically? Or was that too rudimentary? Were there other factors involved that triggered the algo hit? These are all good questions and I try to answer several of them below. In addition to straight removal notices, it’s hard to overlook a specific metric Google is providing in the transparency report for DMCA takedowns. It’s listed on the site as “percentage of pages requested to be removed based on total indexed pages”. Now that metric makes sense! (theoretically anyway). Understanding the total package could yield better decisions algorithmically than just the pure number of takedown requests. For example, if the percentage is 1% or less for certain sites, they might be treated differently than a site with 5%, 10% (or even higher). Note, I saw some sites with greater than 50%! Based on my research, I saw a strong correlation with sites showing 5% or greater and what looked to be Pirate algorithm hits (i.e. 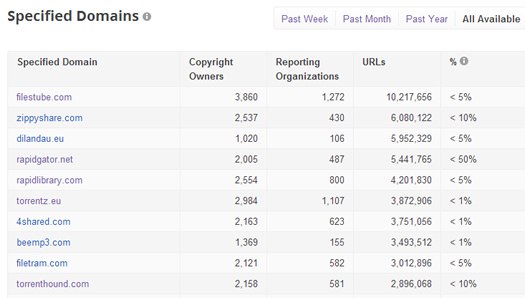 5% of the total urls on the site were requested to be removed via DMCA takedown requests). And for the domains that dropped sharply after Pirate was first introduced, the percentage was often higher. For example, I saw percentages of “<50%” often, and even a few “>50%”. I know this sounds obvious, but if half of your indexed urls have been requested to be taken down, you’ve probably got a serious Pirate problem. :) And it should be no surprise that you’ve been hit by the Pirate update. If a DMCA takedown request has been filed with Google about infringing url(s) on your site, you should receive a message in Google Webmaster Tools explaining the situation, along with links to the infringing content. At that point, you can file a counter notice, remove the content, or choose to ignore the problem (which I don’t recommend). If you do remove the content, then you can fill out the “content removed notification form”. Once you complete the process of removing urls and notifying Google, then you will need to wait to see how your site rebounds. Note, Google provides links to the forms I mentioned above in their messages via Webmaster Tools. In case you were wondering what a DMCA takedown request from Google looks like, here’s a link to a webmaster forum thread that shows a GWT DMCA message. Also, and this is more related to the algorithmic hit you can take, I recommend visiting the transparency report and analyzing the data. You can search by domain by accessing the search field in the copyright section of the transparency report. You can also download and import the data into Access to identify the status of your domain (as mentioned earlier). 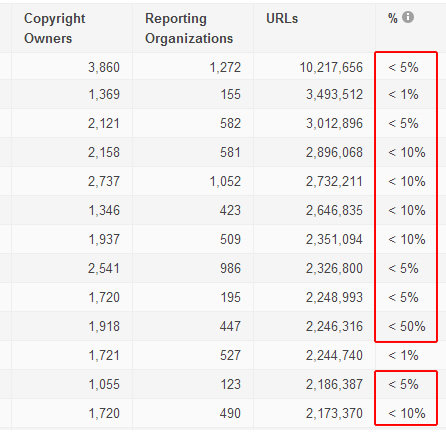 For example, you can figure out how many requests have been filed and review the % column to see how Google understands your entire domain based on alleged copyright violations. If you see a large number of urls, and a high(er) percentage of infringing urls based on total indexation, then it could help you determine the cause of the latest algorithm hit that impacted your site. Or if you’re lucky, you could thwart the next attack by being aggressive with copyright cleanup. I hope this post explained more about the Pirate update, how it can impact a website, how you can research your domain via Google’s Transparency Report, and what to do if you have received a DMCA message from Google. My recommendation to webmasters is to (obviously) avoid breaking copyright laws, take swift action if you are contacted by Google with DMCA notices (remove content or file a counter notice), and to research your domain to better understand the big picture (% of urls requested to be removed based on total indexation).